But through infertility and ectopic pregnancy, I have learnt so much about human biology and reproduction. In fact, I can guarantee that I know more about this than most of my friends and relatives who have actually had children. I know I knew more about ectopic pregnancy diagnosis and treatment than the junior doctors or emergency clinic GPs who were dealing with my case during my second ectopic. And that was before I started volunteering, when I had access to world leading research on ectopic pregnancy, and daily I learned more from the medical professionals (one in particular, she knows who she is) I was working with. I know I'm not alone in this. Every woman who has been through infertility or IVF will come out knowing much more about their reproductive biology than when they went in. I've seen many cases of women having to explain to their own doctors the details of their own cycles, and the implications of these. The misnamed 21-day test to check if a woman is ovulating is a classic example. It is only accurate if a woman ovulates on cycle day 14, and many don’t. My own GP looked at my results and said “I'm sorry, I don’t think you’re ovulating.” But I was charting my cycle, and there was strong evidence that I was. A few weeks later, I printed out my charts and presented them to my fertility specialist at our first appointment. He looked at them and said, “there’s no doubt that you’re ovulating.” I felt vindicated. And I have to say that the more I learnt about my cycle, the more empowered I felt, even if I was in fact learning how powerless we are when it comes to reproduction. Knowledge is power. In my case, it wasn't power enough to conceive or carry children, but it was power. It helped me understand why further IVF cycles would be a waste of money. It helped me understand why I had ectopic pregnancies, and how to keep myself (and others) safe. Knowledge gave me the understanding, and the freedom, to accept the hand I’d been dealt. For me, knowledge was empowering, and I loved learning more and more, regardless of the implications for my own situation, and for years after my own fertility journey was over. It makes me wonder whether, if my education had been different, I might have considered medicine as an occupation. I’ll never know. But I appreciate that my infertility and losses sparked an interest that lay latent within me. I have just finished participating in ICLW for August. It has been a long time since I joined ICLW – it was almost as if I was a newbie doing it for the first time. Every day, I have left at least six comments on other blogs, and in particular I made an attempt to comment on the blogs of the others who had signed up. The experience has made me think, and has brought up a few questions too. For the first time in a while, I was pulled out of my niche within the ALI community, and exposed to the wider community. There were a couple of us who are living life with no kids, there were women who were still trying to conceive through assisted reproduction, women who are adopting, and women who were parenting after infertility. It was good for me to remember how broad this community is, and how we all started from the same place – whether a week ago or fourteen years ago - and to participate in their lives on-line, even if briefly, even if we have ended up with very different lives. But on the other hand, it also reminded me how separate I am from most of the community. I don’t deliberately isolate myself, just reading bloggers who are Not Kidding. I read bloggers who are trying to conceive, or are adopting, or who are now parenting. I read them because we have a connection. But let’s face it, I am way further on in my life journey than most ALI bloggers, and so finding something in common, making that connection, is perhaps more difficult. As I reflect on this, I realise it doesn't bother me at all, and that I am very comfortable with where I am in the ALI blogging world. I blog elsewhere too, and that fills a lot of my needs too. There was a small group of bloggers on the ICLW list that I could not relate to at all. It was a tone and approach and philosophy issue, and I'm afraid to say these blogs didn’t receive any comments from me. I didn't have anything to say to them, although I tried to think of something. But in the end, I just didn’t see the point - for them, or for me. It would be “tick the box” commenting, and to me, that’s a waste of a comment. There were some bloggers who had signed up whose blogs were inaccessible – the links didn’t work or were private, for example – and there were other bloggers who had signed up, but who had not blogged for several months. Others made no effort to blog during the week at all, so there was no conversation going on. Why would these people sign up? They never participated – as far as I could see (though I fully accept that maybe they felt about me the same way I felt about the blogs in #3). So again, I decided that this would be “tick the box” commenting, and that’s not for me. It goes against the principle, as I understand it, of ICLW in the first place. With the above provisos, I happily commented on most of the blogs on the list (most of them new to me) for the first few days. But I struggled to find blogs to comment on during the last few days of ICLW, when there were few new posts. So for the last couple of days, I found myself going through my own list of favourites rather more carefully – those in my reader, rather than those on the ICLW list. I commented on blog posts that I’d read a while ago, but had never commented on (I blame reading my iPad in bed for this). I appreciated the blogs I regularly read (and often who read me) by ensuring I commented. And commented well. It was an exercise in mindfulness, in gratitude, and that was good for me. But this exercise also made me think about some blogs where I read and comment but never (NEVER) get return comments, or even acknowledgements of my comments. I have decided that I will delete these from my reader. I guess I feel I’m being ignored. I make an effort, but it is never returned in kind. I offer support, but it is never even acknowledged. So is it appreciated? I don’t know, but I suspect not. I reach out, in an effort to make a connection – after all, there are not that many of us who blog with no kids – but I am essentially rejected. I don’t comment simply to increase my own readership, or the number of comments I get. That’s not the issue. A feeling of personal connection attracts me to a blog. If, even after months or years, there is no reciprocal connection – whether through reciprocal comments, or a response to a comment, or even a message in a post that commenters are appreciated, then I get the message. I’ll stick with those who care, who engage in a conversation, who connect – for whatever reason – with me in some way. It’s better for my self-esteem, after all. And it is important for me to show my appreciation to bloggers who value it. So this brings me to my final thought. If you comment here, don’t ever doubt that you are appreciated. I respond to comments (sometimes but not always), and I try to visit your blogs too. I don’t always comment (the awkwardness of holding an iPad in bed and typing with one finger, and the contrariness of Blogger freezing on the iPad when editing a comment, all make it harder), but I try to do so regularly enough that you know I care. Because I do. And I'm grateful. Infertility, or loss, helped me save lives. Literally. I got involved in volunteering after having two ectopic pregnancies. The volunteers at our website were largely women who did not go on to have pregnancies after our ectopics. A couple did, and one woman adopted, but several of us never did. The reasons were twofold. One was that we wanted to make sense of our losses, and by helping others we were doing this. The second reason is more practical. We had the time. If I’d successful got pregnant and had a child after my ectopics, then I doubt I would have volunteered. It was a big commitment, and had I been working full-time (rather than self-employed) or been caring for a child, I would never have had the time. You may (or may not?) know that ectopic pregnancies are life-threatening, and even now, in 2014, there are women dying in developed and developing countries because they are not properly diagnosed, or don’t know to seek medical help. I was lucky. I had an alert GP who didn’t make assumptions, and even though she thought I probably had had an early miscarriage, she sent me for serial bloodwork to ensure that this was the case. Other women are not so lucky. I have, over the years, seen countless examples of women who had exactly the same presentation as I had, or even more serious presentations, who were sent home multiple times by their doctors, or by the emergency departments at their hospitals. I've talked to an American who had very concerning symptoms, but who was reluctant to go back to the hospital that had already sent here away, because her insurance didn't consider ectopic pregnancy to be an emergency. I have counselled many women who have been sent away, their concerns and instincts dismissed by busy doctors, and who are then embarrassed to go back in case their concerns are invalid. I've said the words “I would far rather you feel silly for worrying and keeping yourself safe, than a few days later you (or your doctors or I) feel silly when you collapse because you’re bleeding out or worse.” I've had to say those words multiple times. I've had to tell women to "go to the hospital. NOW!" I have, with my fellow counsellors, under the leadership of a very dedicated medical professional, worked with women who have been at their wits end, women who didn't know what to do, women who didn't understand what was happening to them, and women who didn't know if they should seek medical help. There were times, just a few, when it was very clear that one of us, or all of us, had saved someone’s life by sending them to the hospital, giving them the right questions to ask, and the confidence to insist on answers and investigations and treatment. Knowing that I did this? It feels good. Having the ability and opportunity to do that? It was undoubtedly a gift. Grieving loss, and enduring and accepting infertility, meant that for the first time in my life, I gave myself permission to become aware of myself, my emotions, my abilities, my flaws. I learned a lot about what I did well, and what I didn't. I accepted both these parts, and enjoyed nurturing my skills and abilities. And one of the most surprising gifts of infertility was the discovery and nurturing of new talents and skills. Participating in a messageboard post-loss was eye-opening. It helped me enormously, but I also realised that simply by writing about my own experiences, I was helping others. Something about the way I expressed myself helped. That led to a volunteering position that I found enormously rewarding. It both boosted my confidence, helped my understanding of my own situation and of others, and – most importantly – really did some good in this world. But I'm going to take that further. I had always had an ability to look at an issue from both sides, and to understand what another person might be feeling. Acknowledging and nurturing this ability as part of my volunteer work was important. Even if I was still raw from learning I would never have children, or having a bad "woe is me" day, I could never allow this to affect the way I responded to women with children. I had to learn to see things from their perspective, and bring my compassion and knowledge to bear to help them. I'm no saint, and this is rarely easy. But it helped me do my volunteer job well. It helped in other parts of my life too. And in unexpected ways. At the time that I was a volunteer, learning more every day about human nature, I was also the Chairperson of a consulting company (owned by NZ government-owned institutions, working internationally). Chairing the Board was a challenge. I was the youngest director, and the only woman. And so it was inevitable that I endured the sexism of my fellow directors (not all of them but most). I gradually realised though that I could, in the end, get them to do what I wanted them to do. Sure, they ranted and raved and played their petty little political games, or ignored what I said until one of the men said it. But because I learned to understand them, see through their bluster and learn their motivations and insecurities, I learned how to convince them to change their minds. And they probably never knew. This is one of the advantages and disadvantages of the way women learn to operate in the corporate world. Because they don’t realise that they are being convinced of a better way to do things, we avoid the aggression that is often a feature of working with men. But likewise, this means that they don’t see or recognise the skill or advantages in my (a woman’s) argument, and we don’t always get the credit we are due. Still, it is interesting to reflect and realise that part of my personal growth in the last decade became part of my professional growth too. After learning that I am not alone, I found friendship. This is the easy one to write, because it is the one I have written before. I started expressing my gratitude for the friendships I had gained out of loss and infertility over a decade ago. First came loss. I met and talked to and was advised by and, perhaps most importantly, grieved with some wonderful women on-line, after our ectopic pregnancies. Wise women, women with compassion, and women with wonderful humour, they helped me through the hardest times of my life. And I hope with all my heart that I helped them too. As one of these friends said, we got to know each other from the inside out; raw, hurting, with open wounds. Friendships that first developed on a message board, moved to more informal online chatting, and then blossomed in real life. 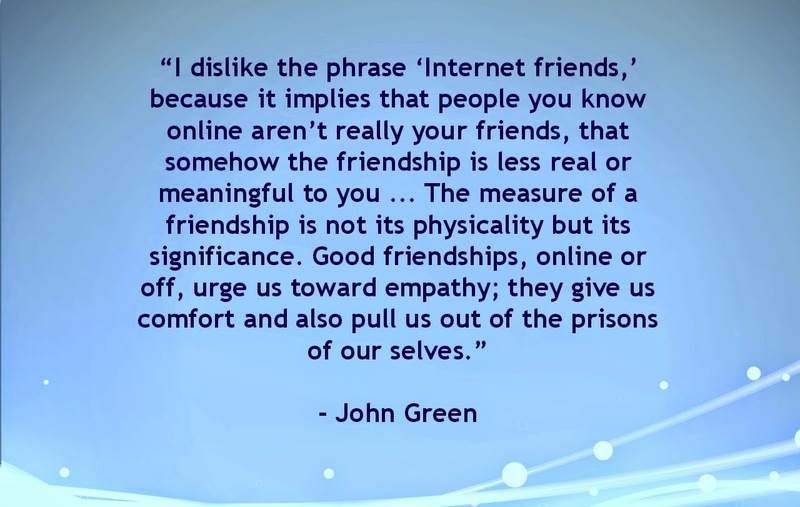 Some of my on-line friendships have lasted 12 years. We chat on-line regularly, even though our lives have changed. Most importantly, we know that whenever we need to get something off our chest, whenever we are going through something tough, the others will be there for us - and vice versa. Some friendships, including my blogging friendships, the relationships I am building here, are more recent. The thing I have learned is that these friendships are real, whether we have met or not. I look forward to nurturing them for years to come. Here’s a selection of posts where I have expressed my gratitude for the friendships that have come as a result of loss and infertility and a No Kidding life. Finally, I thank you for your friendship, and for the friendships you develop with others in this community. They are important. And they are real. I have been blogging here for almost four years. Not so long really, but I have actually been writing about infertility and pregnancy loss for a lot longer. In fact, I started posting about pregnancy loss, and the related infertility fears, back in 2002 - twelve years ago, several years after my journey in infertility began. In October 2003, I was forced to switch and start talking about living the rest of my life without children. So for ten years, I’ve been thinking about living a No Kidding life. That’s enough time to have figured out some things. I certainly don’t have it right yet. I'm not 100% at peace, and I probably never will be. But let’s be honest, who is 100% at peace? Not most of my friends. And I'm pretty close. And the first is that, as a result of infertility, I know I'm not alone. I've felt alone in the past, wondered if people understand me, if I am the only one who feels the way I feel. Then I experienced loss through ectopic pregnancy, grief, and infertility that brought more loss and grief. Initially I felt very alone when I went through all this. I wrote about it here. But now I know. However alone I might feel when surrounded by parents, kids, grandparents and grand-kids, I know I'm not alone. Infertility and loss made me feel terribly alone initially, but ultimately, the connections I have made with other women have reminded me that we are never alone. There are always others in the world who know how we feel, who understand what we go through, and who share our fears, our thoughts, our rages, and our joys. And this knowledge applies to our infertility, but to other aspects of our lives too. If we’re not alone due to our childlessness, then it must follow that we’re not alone in other areas of our lives either. We just have to look for our people. We are not alone. We are never alone. That is not a little thing. This time last year, I was meeting the lovely Klara for the first time. 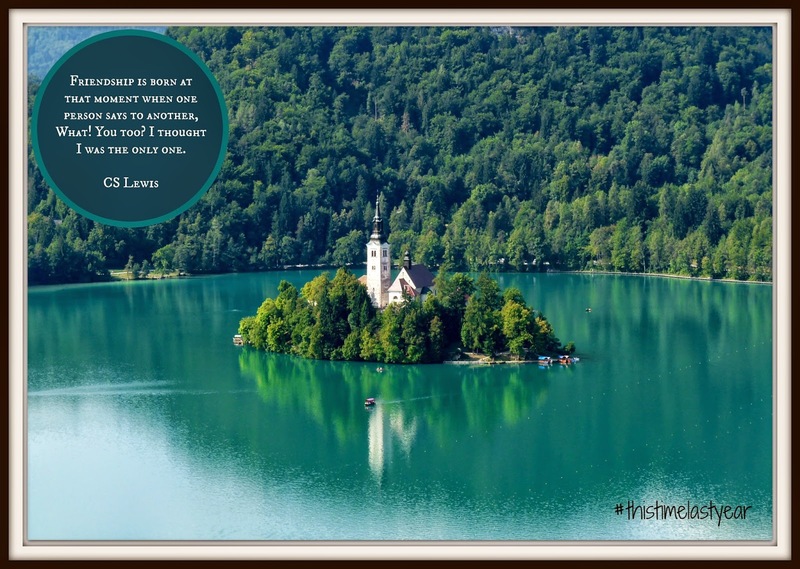 She and her husband are once again enjoying a northern summer, with the stunning scenery of Slovenia as a backdrop, enjoying summer produce, and - no doubt - she at least is doing some swimming in Lake Bled. I, on the other hand, am at home in Wellington this year, enduring rain, hail and wind, looking for jobs, getting back to fitness, and getting things done around the house. Winter trundles on. But the good memories remain. I wrote last year that this - new friendships and good memories - was one of the gifts of infertility. The memories are boosted by the fact that I've finally finished my last photobook covering our overseas odyssey last year, and it includes pages on our all-too-brief sojourn in Slovenia. All my friends who have seen it have gasped at some of the photos, and last night, one friend in particular (who is living in Europe) has determined that she must visit. The gift keeps on giving. Recently too I can add another new friend to the list of gifts. A blogger who I missed seeing in Italy last year, but who has conveniently (for me at least) moved to Wellington. She might be regretting that now, as hail batters my skylight as I write this. But I'm not, because it is another gift, the chats and coffees we've shared so far this winter, and the ones we will hopefully share in the future. I know that the whole concept of gifts of infertility was (and maybe still is) foreign to a number of my readers, and will be to any new readers who land here. So I wrote another post where I outlined how I feel I had come through the pain to recognise these gifts. I found this post again when I was looking up exactly when I was in Slovenia. And I feel it still stands. Right now, I'll enjoy remembering beautiful Slovenia, how I felt about it this time last year, and celebrate new friends.